If you are looking for a light weight vest to workout in and you do not want to pay a lot of money for it, then the Tone Fitness Weighted Vest is an option for you to look at. This will give you fantastic vest that is easy to exercise with where mobility is crucial and you don’t want a weighted vest getting in the way. You can definitely use this for activities such as walking, kickboxing at home cardio workouts or anything where you need a lot of body movement, but you want to increase the amount of resistance that you get. On this page we will walk you through some of the features and we will also tell you about the customer opinion see you can see exactly what people are saying about this product and whether it is the right one for you.We will also walk you through the pros of the features and who this vest is suitable for. Need a Quick Detailed Look? Check out the best price on Amazon here. You will find that the Tone Fitness Weighted Vest is more suited towards people that need a light to weighted vest but there also want to add the resistance to the workout and you will be able to use this for strength training. If you know that you want purchase this particular best you can click here and go straight through to Amazon.com to check it out. You will also find that this is constructed of soft neoprene material which will give you added comfort and you will get pocket to hold an MP3 player or your cell phone as well as reflective strips for safety while walking or running at night. This is another really good reason why you might want to pick this one if you are using a weighted vest with your running. This is also great for pretty much any size and the any downside with that is that some people that are larger have said that is on the small side but it is a one size fits most. The downside with this vest is that you can not go any heavier than 12 pounds. So, if you are wanting something that is heavier in weight and you can adjust the weights then I would check out our review on the Cross101 vest. You also need to know before you buy this vest that you cannot adjust the weights. This will not be a problem for most people because they will want to buy this type of vest because of the cheap price this vest costs. You will deal with the fact that it’s a 12 pound vest and adjust your use for it. I will say I saw some people frustrated because they wanted to use this for running and starting out with 12 pounds right off the bat was too much for them. So, keep that in mind. If you want something you can adjust that is still really light weight and affordable then look at the HumanX weighted vest here. It’s very similar in weight but you can adjust it and it comes in 10, 20 and 40 pound models with removable weights. Who is The Tone Fitness Vest For? We recommend that if you are buying the Tone Fitness Weighted Vest then you are using it for jogging, walking, body weight exercises or running. It is a fantastic starter weighted vest that you can use for a ton of exercises.It is very affordable for anyone to give a try and those of you who want a little more challenge when you are walking this is a great option. 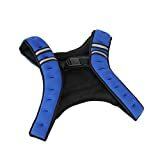 You will see this as a best seller on Amazon and I’m bias about the fact that it is because it’s one of the cheapest weighted vest I have seen on the market. That doesn’t mean it’s right for you. Please make sure you are ok with this vest being 12 pounds and you cannot adjust it. Many people bought this and it was too much for them. There are a ton of people though that just love it. So, please have a specific goal for this vest and make sure it will fit your needs. So, remember this is a one size fit all weighted vest that is 12 pounds and is not adjustable. So, if you want a way to get a cheap vest then look here more on amazon for the best price.